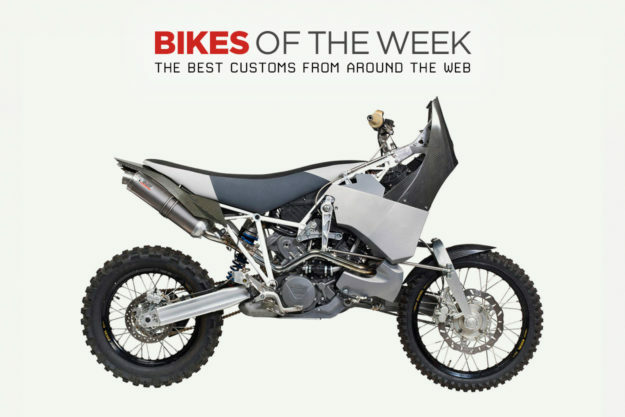 A two-wheel drive KTM, a super-caffeinated Harley Sportster, a Radical Ducati tribute from Taiwan, and an African dirtbike with an incredible 250 kilo payload capacity. 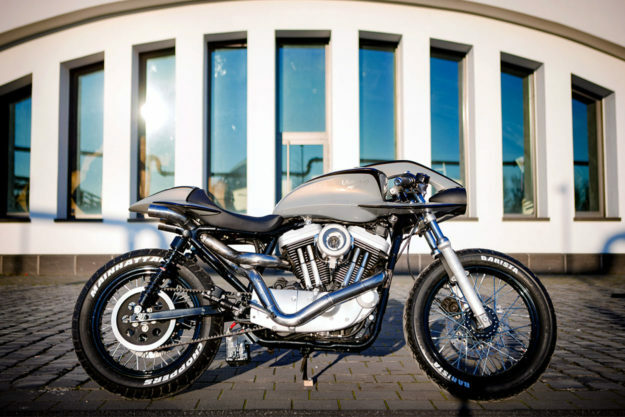 Harley-Davidson Sportster by Mainhatten Choppers If someone told you they built a cafe racer out of a Harley Sportster, would you picture this? 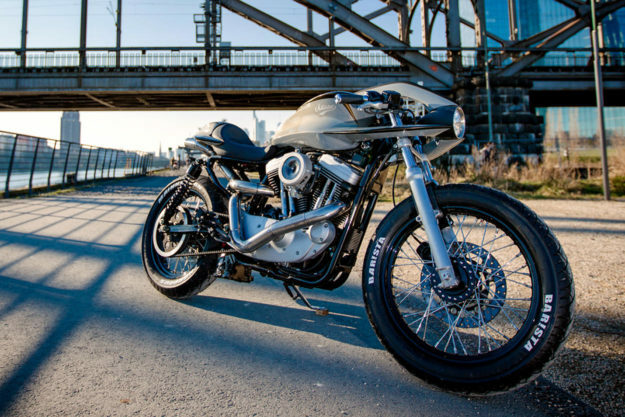 Frankfurt-based Mainhatten Choppers were obviously looking to buck a trend when they tapped their mate Ian Alderton to help sketch out the beginnings of ‘Bar!sta’ here. The futuristic vibe of this twin hits like a quad-shot of espresso and, frankly, we’d like to order another. The good news is that we can. Bar!sta was developed to be a limited edition kit bike, with parts fabricated so other H-D owners can make a statement. Working from collaborative sketches, three years of clay modeling, prototyping and refinements took place to nail down the swooping lines. My favorite touch is by far the work around the headlight; Almost an anti-fairing, the way those strakes wrap around the cockpit and join the scalloped tank is a damned fresh approach. 2WD KTM 990 Adventure A couple of years back, I had the chance to feast eyes upon the two-wheel-drive KTM built for REV’IT! by Gregor Halenda, with the help of a Christini sourced front-drive mechanism. Needless to say, Gregor’s bike left me and my V-Strom in the Oregon dust with every twist of the throttle. 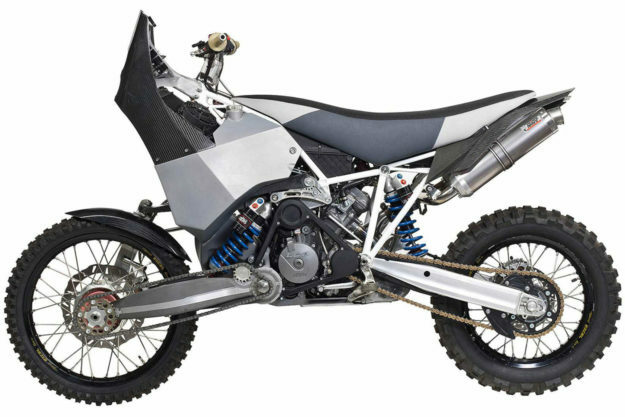 But as radical as that bike was, this fresh take on an AWD KTM from mechanical engineer Guido Koch is next level crazy. Starting with a highly capable KTM 990 Adventure, Guido took ten years to develop a home built kit that he calls the DT-A. My guess is DT-A stands for “Down To Adventure” since everything about the donor bike has been tweaked for optimal off-road prowess. 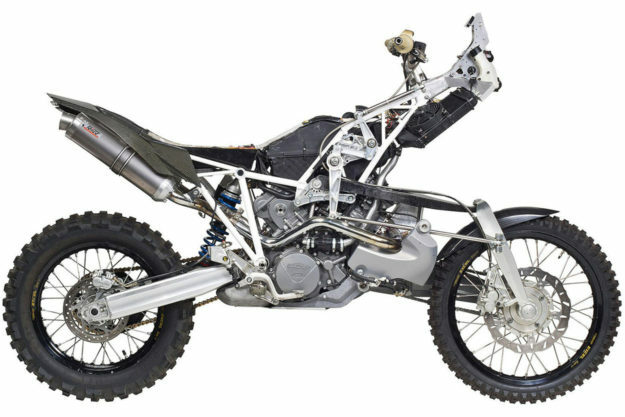 The frame is entirely bespoke, as is the front end—which now relies upon a hub-centered steering device and a one-off swingarm to allow maneuverability without derailing the front drive mechanism. There are three fuel tanks capable of holding 27 liters, and Guido even developed his own CV joints. Automotive units would be too heavy and clunky. Ducati MH900E by Igor Ou Pepo Rosell’s work in his previous life at Radical Ducati was nothing short of jaw-dropping. Not that what he’s doing now isn’t remarkable, but those early days cemented his following. 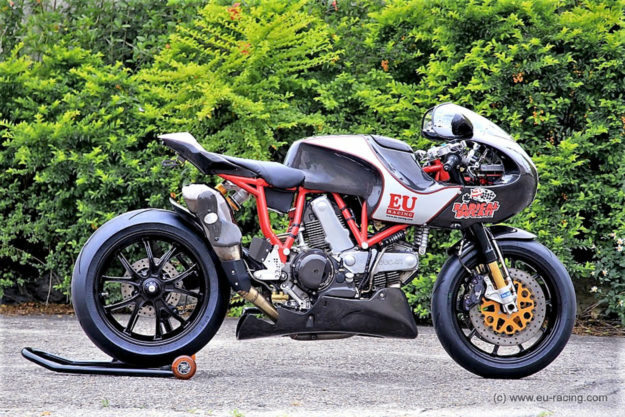 So much so that Taiwanese builder Igor Ou decided to create this Ducati MH900E in tribute to Radical Ducati. 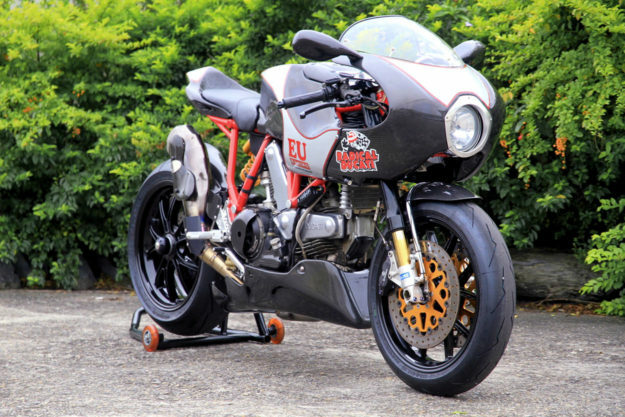 The build began life as a pleasant but pedestrian Ducati SS900ie, but it has received a bundle of upgrades in both the show and go categories. Since Igor is the manager at EU Racing Taiwan, a distributor of go-fast bits, sourcing parts wasn’t exactly an issue. In fact, the ingredients list reads like a how-to in high-end modification: Marchesini forged wheels keep unsprung weight to a minimum, the IMS triple clamp looks both pretty and strong, the Daytona gauges provide some classic retro pop to the dash, and the fully-adjustable Öhlins suspension is, well, just proper. 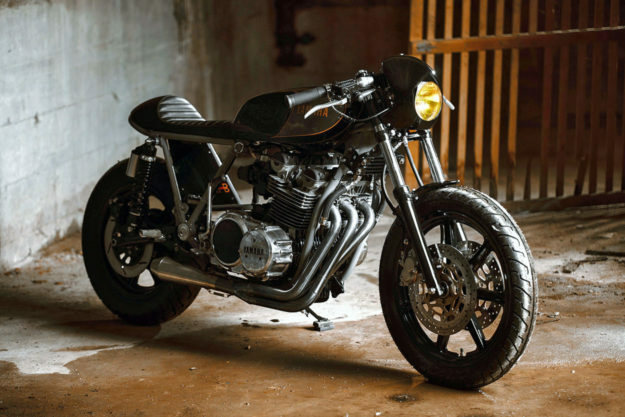 Yamaha XS850 by Brick House Builds Just over a year ago, a Honda ATC250R-inspired CX500 headlined this very column. It was all kinds of playful, retro and radical. 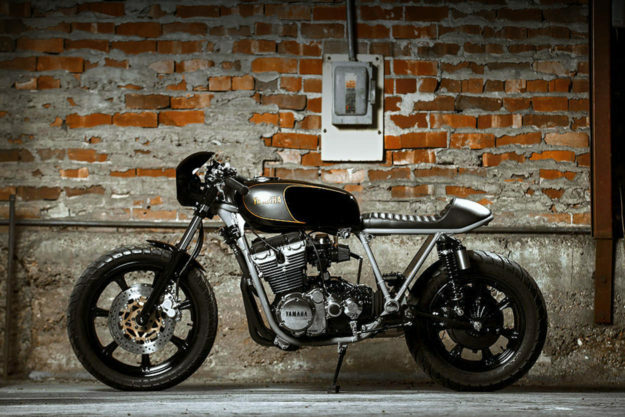 This time, builder BJ English of Brick House Builds has taken a more traditional route—but his Yamaha XS850 based cafe racer is no less impressive. For ‘Triple Trouble,’ BJ was aiming for a textbook cafe silhouette, clean and understated. That mission was accomplished by taking the stock frame and treating it to a complete de-tabbing routine. The subframe was also binned, in favor of the new hoop that tapers neatly at the tank and curls slightly at the end to match the new seat. The front end from a FZR was fitted into the stock XS stem and with some help from the CNC machine, the hubs from that same FZR were mated to the XS’ original wheels. 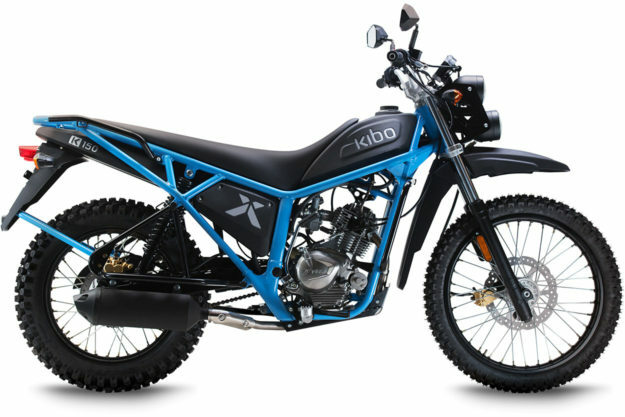 Kibo K150 dual sport On these pixelated pages, we typically celebrate the motorcycle for what it can become: how skilled hands can coax beauty and brawn out of steel and sweat. But every now and then a factory creation comes along that reminds us why bikes tugged our attentions in the first place: for what they can do. 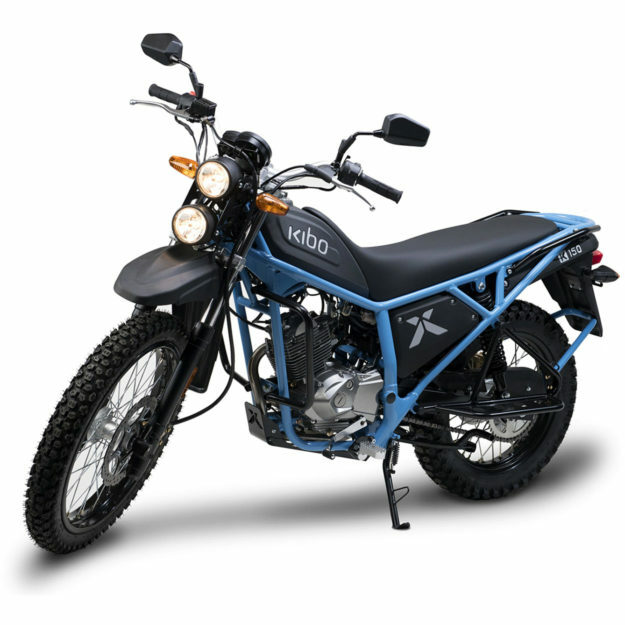 The Kibo K150 is a purpose built dual-sport that was created to quite literally move Africa. Developed in Holland and assembled in Nairobi, the Kibo was designed to conquer Kenya’s harshest terrains while delivering an incredible payload of 250 kg (550 pounds)—to get crucial supplies where they’re needed, in the quickest overland manner possible. The air-cooled 150cc SOHC thumper was chosen for its simplicity and reliability. It’s also been tuned to deliver most of its torque in the low end, to help crawl through all types of conditions. The front wheel is a 21-inch unit and there are almost eight inches of ground clearance, so obstacles shouldn’t pose much of a problem. And the tank holds 6.8 liters (1.8 gallons) of fuel.